ACT Parks and Greening Australia have released the draft plan for Woodland Restoration in the Belconnen Hills area (Black Mountain to Murrumbidgee Corridor). A working group of park carers, including from Friends of The Pinnacle, has had input to its development. The draft has been forwarded to the parkcare groups involved for comment. If you would like to read the plan, download it from the link below. Comments can be submitted to by 21 January 2012, for inclusion in the fotpin response due by 27 January. Draft Plan for Woodland Restoration in the Belconnen Hills [ 6 MB ]. Greening Australia have offered to run a seed collection workshop for fotpin members next year, possibly in March. The workshop would comprise a PowerPoint presentation and a practical demonstration on site. If you're interested in participating and will be around next March to attend the workshop, please let know. After a lapse of a few months while we got established in the new weeding year the weeding effort summary page is now up to date to end of October. Novembers numbers will be added next week. monthly distributions of effort for different paddocks, different weed types and different treatment methods; this lets us see, for example, how the weeding requirements for different weeds changed from month to month across the year, how the effort required in different paddocks changed across the year, and the phasing in and out of spraying, seed bagging and slashing requirements. distribution of effort across different weed types in each paddock; this lets us see which weeds are dominant in which paddocks, and how they are spread across the paddocks. Effort so far this year has been spent in very different ways to last year, primarily because of the different weather that we are experiencing this year compared to last. The greatest effort for the year so far has been required for Verbascum, which is having a bumper season. This is well illustrated with a new way of looking at the data - a year-on-year comparison of effort this season compared with that last season for each weed type, which includes a discussion of the possible reasons for the differences. Total effort so far this season is almost double that to the same time last season, and only just short of the target set in the Weed Plan. This is attributed to weather conditions that are more favourable to weeding, an increased number of active volunteers, and the ability to start spraying weeds earlier because of the availability of appropriate chemicals and Chemcerted volunteers. Weeding maps have also been updated for the 2010-2011 year as well as the 2011-12 year to date. Fireweed has been recently located on the Monaro Highway, not far from the ACT border and also in Watson. It is a Notifiable & Prohibited pest plant which forms a persistent seed bank if not controlled. For information on identification, control and notification, see Fireweed alert [ 390 kB ]. Fotpin has received an invitation from the National Capital Authority (NCA) to participate in a discussion about the National Capital Open Space System (NCOSS) - see below. The Coordinating Committee plans to make a submission, but encourages individual members to comment as well, or have other input as suggested below. The NCA is seeking community views on the Australian Capital Territory's unique landscape setting. The last major policy review of the NCOSS occurred in 1989-1990. Today the NCOSS remains an integral part of the layout of Canberra. The NCA believes that you and your organisation can provide an important contribution to this review >and asks for your support. You are welcome to call, or email me if you have any questions regarding this review. Please forward this letter to your friends, associates and members. A program of 6 diverse guided walks and related activities has been organised for late September - late November. All supporting papers for the Annual General Meeting as well as the draft Minutes from the AGM held on 24 July are now available from the governance page. Landcare Australia and Spicers have awarded fotpin a one off funding contribution for the our Pilot Revegetation Project. This small grant of $2,873 will cover the cost of stakes, tree guards, ties, etc and a water tank to be installed on site to facilitate the watering of the seedlings through the summer months. Seedlings with provenances appropriate to the Pinnacle will be sourced from Greening Australia. Planting will be by fotpin volunteers on a date to be announced in Spring. Thanks to John Brannan and his team (Rosemary, Len, Penny, Malcolm and Jim) for carefully planning the project and nursing it through the funding application process, and to all others who helped along the way. Some information about the pilot project may be found here; more information will be available soon. The total is 25% above the target for the month, reflecting that (a) the weeds are still very much rampant and needing our attention, and (b) for years such as this one the target for May is likely an underestimate. The most targeted weed species for the month were thistles (23 h) followed by woody weeds(19 h, 8 of which was briars) and various broadleaf weeds (9 h). These are expected to continue to be targets for June. It provides a good guide to the amount of effort required to manage each weed type, especially in those cases where we believe we have treated effectively all the weeds of a given species (as in the case of blackberry). The spatial information coupled with the effort provide us with a good indication of the severity of the weed problem in particular locations, and, depending on the weed type and the weather, an indication of how much effort may need to be applied in particular areas next year. The spatial information coupled with the date and type of treatment will enable us to assess the effectiveness of of given treatments at certain times of the year. And there's no doubt more uses will emerge with time. So, thanks to all those who logged their effort and provided GPS information about where the effort was expended - it really makes a difference. Keep up the good work! Note: fotpin now has 4 GPS units available for use by weeders, with simple instructions and brief training available as required; contact or . The Office of the Commissioner for Sustainability and the Environment has announced the release of three more community information papers prepared as part of the Investigation into the Canberra Nature Park (nature reserves); Molonglo River Corridor (nature reserves) and Googong Foreshores. Report on the Investigation into the Government's tree management practices and the renewal of Canberra's urban forest: Summary and Recommendations (pdf, 1.3Mb) or full report and appendices. Report on the Investigation into the Government's tree management practices and the renewal of Canberra's urban forest: Summary and Recommendations[ 1.3 MB ] or full report and appendices. The total is 25% above the target for the month, reflecting that (a) the weeds are still very much rampant and needing our attention, and (b) for years such as this one the target for April is likely an underestimate. The most targeted weed species for the month were Verbascum (21 h) followed by Nodding thistles (10 h) and woody weeds (8 h; 11 h including briars). These are expected to continue to be targets for May, with horehound and briars assuming a greater component as well. Note: fotpin now has 3 GPS units available for use by weeders, with simple instructions and brief training available as required. fotpin members, family and friends turned out in force on a beautiful Canberra autumn weekend to make significant contributions to two of our projects, the grass experiment and the kangaroo count. A sterling effort on Saturday morning, saw the spreading of the Ryecorn seeds and sprinkling of sugar on the grass experiment plots completed ahead of schedule. This now completes the application of treatments for this year. The soil and plant samples are in the lab at ANU and analyses are underway. The next activities for the grass experiment will be in early September, when we have to reapply the sugar, and, (fingers crossed) harvest our Ryecorn crop. Depending on the timing of growth of wild oats, we may be up to slashing the slash treatment around then too. Stay tuned. Sunday saw a great turnout for both the morning and afternoon kangaroo counts, guided by Don Fletcher and Claire and from ACT Land Management and Planning. Both sessions were very successful, although lessons learnt from the morning session helped the afternoon one go more smoothly. Don is tallying up the numbers and will let us know the result, but early indications are that there are many more roos that anyone expected. Thanks to all those who participated. For those who couldn't make it this year, stay tuned for a repeat performance of both projects next year. Saturday also marked the end of yet another month where weeding effort was greater than the target value in the Weed Plan (by about 25%). A summary of the month's weeding activities will be on the website in the next day or two. This is 75% above the target for the month, reflecting that (a) the weeds are still very much rampant and needing our attention, and (b) for years such as this one the target for March is likely an underestimate. Most targeted weed species for the month were thistles (mainly nodding thistles) and verbascum. Both are expected to continue to be targets for April, and we also need to start on horehound and briars, both of which have had vigorous growth this year. On Wednesday 16 March, a group of about 40 Chairs of Natural Resource Management Groups around Australia visited The Pinnacle. 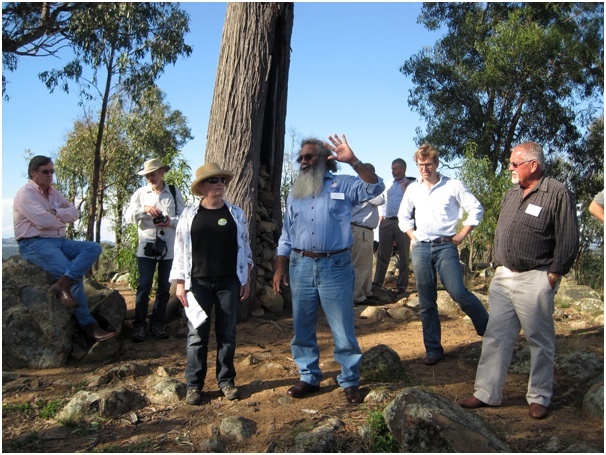 This was the third and final stop on the afternoon field tour that was part of the Chairs' Annual Forum, hosted by the ACT Natural Resources Management Council in Canberra this year with the title "Keeping the bush in the Bush Capital". The other stops were Mt Pleasant and Mulligans Flat. The group walked from the De Salis St carpark to the saddle just below the Pinnacle to hear a presentation by Warren Bond on our weed management and tracking activities, then on to the Defeating the Weed Menace plot just above the Woolner Circuit entrance to hear from Don Driscoll about the Native Grass Restoration Project. They then walked back across to the Pinnacle to enjoy the wonderful view in the late afternoon light, the perfect spot to hear from Heather Burness about the location of The Pinnacle Nature Reserve in the 'landscape' and how fotpin is fostering the community's connection with and sense of 'place'. Feedback from the ACT NRM Council has been positive, with the Chairs impressed with the range of work that urban parkcarers are doing in Canberra, and, in the case of fotpin, with the leadership of the community. Click to read the 2 page handout [ 390 kB ] that we prepared for the Chairs. They also received a copy of out latest Newsletter. You can see more images from the visit in the photo gallery. The Office of the Commissioner for Sustainability and the Environment today announced the release for community information of three papers prepared as part of the Investigation into the Canberra Nature Park (nature reserves); Molonglo River Corridor (nature reserves) and Googong Foreshores. The General Meeting convened at the request of member Dr Mervyn Aston was held at 7-30 pm on 15th March at the Weetangera Primary School with 21 members and 1 non-member present. Dr Aston raised a point of order regarding the democratic process in the calling of the meeting which was ruled against by the Chair of the meeting. The members upheld the decision of the Chair through a majority of votes. After a brief statement, Mervyn withdrew his motions. It was agreed that the Coordinating Committee will meet with Dr Aston at a later date to discuss his concerns. The meeting closed at 8.10 pm. After the meeting closed an informal general discussion of his concerns that led to requesting the meeting followed. A program of 3 diverse walks has been organised for late March - early April. Details at Autumn walks. The outstanding weeder of the month was again Bob Hodgson, with Pax bumping John Brannan out of second place. Today 14 fotpins put in a combined effort of 40 hours tackling the current priority weeds verbascum and nodding thistles as well as prickly lettuce, nightshade and a number of woody weeds (Chinese Pistachio, cotoneaster, firethorn and briar roses) that were encountered along the way. In doing so, we pushed the total weeding effort for January to over 180 hours, well in excess of the monthly target of 161 hours (from the Weed Management Plan). This is the first time since effort records began in July 2010 that the monthly target has been exceeded, and is testament to the enthusiasm with which our regular weeders have been tackling the current weed threats, particularly saffron thistles and St Johns Wort. Details of the month's weeding effort will be published on the weeding effort page in early February. The weary weeders, as well as spouses and other fotpins, then relaxed and enjoyed a pleasant BBQ lunch thanks to the hospitality of Pax and Susan. Overall, a successful day for The Pinnacle and for the Friends of The Pinnacle. In honour of Australia Day, on Wednesday January 26 fotpin will be hitting the exotic weed invaders hard. We will then adjourn to 68 Southwell St for a BBQ lunch to celebrate our efforts. Please bring what you would like BBQed and your drinks; bread, salad etc. will be provided. This is a good opportunity for the hard working weeders from the different teams to meet up and compare notes, and also for non-weeders to meet other fotpins. Please feel free to come to either the Weeding Bee, the BBQ, or both, but please RSVP to for planning purposes as soon as possible (both for weeding, to plan equipment, and for the BBQ to plan catering). Where? Suggest we weed across the Forest, Hawker and Central paddocks, and just south of the Forest in Kama paddock. Time permitting we can also do the top end of the Dam paddock. I'm proposing these paddocks as they are easily accessed, we'll be visible to users, and certainly Forest and Hawker are priorities for weed control. nightshade, grub only, and pile larger patches of plants for later removal (time permitting) or more efficient spraying next year. Small patches and isolated plants with berries can be bagged - but beware this could be bag consuming - best try to minimise the amount you bag. Teams of 2-3 should efficiently cut, grub and bag. When? There will be two start times, 7am and 8am. 7 am: Hawker fotpins meet along the footpath between 14 and 16 Marakai St.
Everyone else fotpins please assemble at the noticeboard just west of the de Salis St carpark. Pax will lead the team off from there. 8 am: Meet at the noticeboard just west of the de Salis St carpark. Someone will be there to set you up, allocate teams to paddocks, etc. 8am starters might either form new teams or bolster existing teams. Alternatively, Rosemary, Lesley and John will be weeding the Forest Block from 8am, meeting at Dungowan Street, if you want to join them. 12 noon: I'd like everyone to be at #68 by noon for the BBQ. How? We'll have hoes, loppers and bags available, but bring them if you have them. All the usual common sense advice re clothing, sunscreen, sturdy footwear, water, fotpin sense of humour, apply. Would those of you with GPSs please bring them - remember to have good batteries. As part of our effort monitoring we'll record 'track logs' of where the team goes so we can report on what we're doing and usefully speculate where we need to return to. Please bring your GPSs to lunch and I'll download, and we can all see where everyone worked. 12 January 2011: 2010 "Scribbly Gum"
The Federal Government has announced that Don Driscoll's proposal was funded to the value of $19,930 in the 2010-11 round of the "Caring for our Country" Community Action Grants Program. The Native Grass Restoration Project was one of only two projects funded in the ACT (453 Australia wide). See the press release and the list of funded projects for further information. Combined with the earlier funding from the ACT Environment Grant and the Belconnen Labor Club, this additional funding allows the project to proceed at its fully planned level of 12 replicated plots as described in the project methodology. Congratulations Don for securing this important additional funding. Recognition of the value of this project by a second major funding groups reinforces its importance. Assistance from volunteers will be essential, however, for its successful completion. For information about tasks that assistance is required with in the coming weeks, check This Week on The Pinnacle and the Action Plan or contact . More details of the project can be found on our website at Defeating the Weed Menace. Our application for funds from the Sponsorship Committee of the Canberra Labor Club Group (through the Belconnen Club) has been successful. The Club has granted $9346 towards the Native Grass Restoration Project in this financial year, with the option to apply fir a further $9346 next year. This grant, combined with the earlier ACT Environment Grant, ensures that we have sufficient money to fund the project at the basic level of 8 replicated plots. Well done Pax for pursuing this line of funding. More details of the project, including a preliminary list of activities that will require volunteer assistance, can be found on our website at Defeating the Weed Menace. Three Spring walks were announced: a bird walk with John Brannan, a diversity of species and habitats walk with Rosemary Blemings, and Native Grass Restoration Project walk with Don Driscoll. Articles include: Friends of Grasslands Kama woodlands tour (by Don Driscoll), Preparing for Spring (by Rosemary Blemings), Spring bird report (by John Brannan), Saving Our Soils (by Pax), and Monitoring rabbit activity (by Pax). The Coordinating Committee is very pleased to to announce that that fotpin has been successful in gaining funding through the 2010-11 ACT Environment Grants for our Grass Restoration Project. This is a fotpin project applied for under the auspices of Ginninderra Catchment Group. The group is very grateful to Don Driscoll who conceived and designed the project, prepared the funding application, and is now leading its implementation. If you attended the Special Meeting at Weetangera Primary School on the 25 July of this year you would have seen Don briefly and succinctly outline the project. This means that we will be busy fotpins and will need to rally in achieving this worthwhile project and its outcomes. There will be many opportunities for members to contribute and the Coordinating Committee will make these known when we have determined the volunteer help needed to see the project through. The project will be a good opportunity to learn about the restoration of native grasslands. A community meeting was held on 25 July at the Weetangera Primary School with a view to formalising Friends of The Pinnacle as an unincorporated body. The meeting modified and ratified a set of Draft Rules [ 36 kB] for the group that had been previously prepared by a volunteer working group, and were presented to the meeting by Mark Burness. Nominations were called for to form the Coordinating Committee as specified in the Rules, and 6 were received. The meeting also heard presentations on the history of fotpin (Rosemary Blemings), the proposed Native Grass Restoration Project (Don Driscoll), monitoring of bird species on The Pinnacle (John Brannan), and weed management on The Pinnacle (Bob Hodgson). Draft minutes of the meeting, to be ratified at the next general meeting of members, and the composition of the Coordinating Committee, may be found on the governance page of this website. The Draft Community Weed Management Plan for The Pinnacle Nature Reserve (2010 - 2020) was launched by Andrew Leigh (then ALP Candidate for the Federal Seat of Fraser) at an event held near the De Salis Street entrance to The Pinnacle on the morning of 16 May. After the launch, Andrew helped plant a commemorative tree a short way up the track from the entrance. Images of the event may be viewed in our photo gallery. The draft plan is now open for comment from all members of the community. Comments on the plan may be submitted to: .